INVITES YOU TO VISIT OUR DISPLAY! If you haven't already registered - you will need to do so. Register for FREE here. A new and exciting experience awaits you at the 2018 Melbourne Gift Fair! 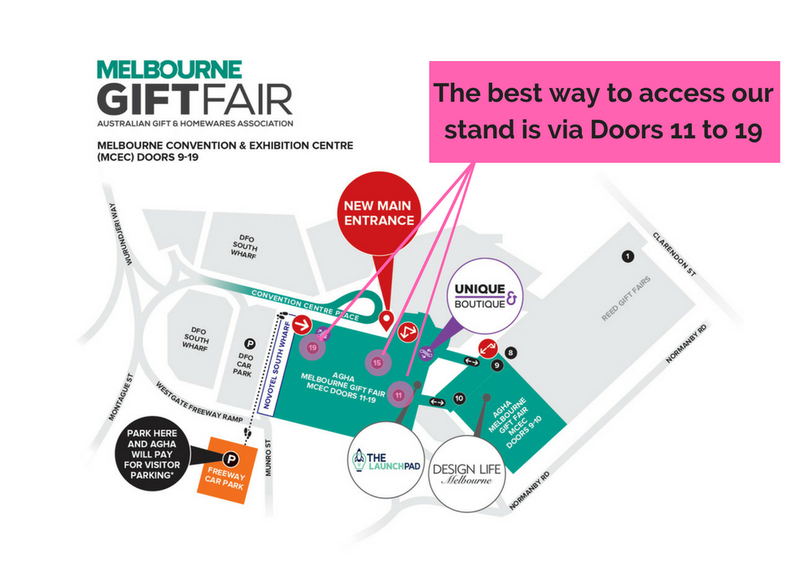 For the first time, all AGHA Melbourne Gift Fair exhibitors will be located in one convenient location at the newly-expanded Melbourne Convention & Exhibition Centre (MCEC) between Doors 9 - 19 and on Level 1. Look for the "all gold" brand new main entrance at the Melbourne Convention & Exhibition Centre, at Convention Centre Place near DFO South Wharf. The Melbourne Gift Fair is paying for visitor parking* adjacent to the MCEC. Simply park at the Freeway Car Park located off Munro Street. It is a short 200 metre walk from the car park to the MCEC's new main entrance at Convention Centre Place. Just follow the signs! *Bring your Freeway Car Park entry ticket and your Melbourne Gift Fair badge and follow the signs to the signposted Transport Hubs to have your parking validated. Please be aware that validated parking only applies to the Freeway Car Park. Check out the website for more information. If you are travelling by train, the AGHA Melbourne Gift Fair is putting on free city shuttles running to and from Flinders Street Station and Southern Cross Station and the MCEC. Departing every 30-40 minutes, these shuttles will drop you off at the entrance of the Fair. Find the shuttle schedule here. If you are travelling by public transport, jump on a tram or bus straight to the MCEC each day. For public transport timetables, visit the Public Transport Victoria website here. Ask your Taxi or Uber driver to drop you at Melbourne Convention and Exhibition Centre at the DFO end of the building. Also, for the return trip home, the taxi rank is conveniently located at the same location. The Melbourne Gift Fair is providing complimentary airport shuttles between Melbourne Airport and the new main entrance at the MCEC. It is important to reserve your place on the shuttle bus as the service is in high demand. View the shuttle schedule and book a seat here. How you can find us once at the Gift Fair? Our stand is now easier to find! NEAREST ENTRY: Enter via the new main entrance at Convention Centre Place near DFO South Wharf or Novotel South Wharf entrance and access via Doors 11 to 19. 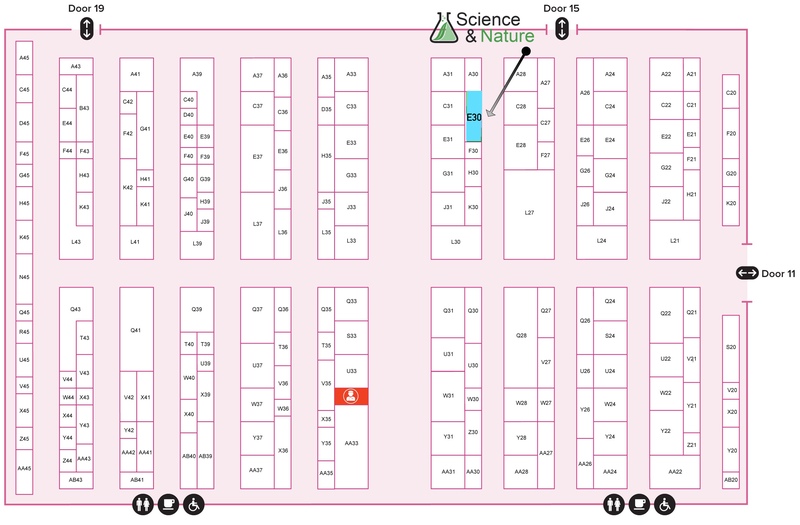 Once inside Doors 11-19, you can find us at E30. While at the Melbourne Gift Fair don't forget to visit more than 400 other exhibitors to see thousands of new and exciting products and all the new season ranges. See all AGHA Melbourne Gift Fair displays between Doors 9 - 19 and on Level 1 of the Melbourne Convention & Exhibition Centre. Registration is free to attend for trade buyers! WE LOOK FORWARD TO WELCOMING YOU TO OUR NEW STAND IN 2018. For more information, registration details, accommodation or travel arrangements please visit melbournegift.com.au or view the comprehensive Exhibition Directory Online.